#ASDNext is a new campaign designed to spotlight the most helpful resources and information for Pennsylvania teens and adults with autism. Featuring projects and resources on a wide range of topics including housing and community living, autism and employment, postsecondary educational opportunities, autism speaks adult services grants, advancing futures for adults with autism, adults with autism in the news and adults with autism resource library. Community Integrated Services’ mission is to empower people with disabilities through individualized employment opportunities that foster self-sustainability, equality, and community. Through partnerships with area businesses and organizations, CIS works to find jobs that fulfill the employment goals and desires for the people they serve. Customized Workforce Solutions (CWS), a program of Valley Forge Educational Services, provides employment-related services to adults with disabilities. Children and adults with behavioral health diagnoses often exhibit sensory systems that are imbalanced or not 'in-sync.’ In-Synch and Social provides both individual and group therapy to address sensory and socialization deficits. JCHAI’s family of programs offer supportive independent living for people with disabilities 18 years and older. JEVS Human Services has 20 successful programs providing skills development, job readiness and career services, vocational rehabilitation, recovery services, adult and residential day services and in-home personal assistance. Kaleidoscope Family Solutions (KFS) provides a collection of services designed to help special needs children and adults achieve their dreams and live meaningful lives. Through its Specialty Divisions, KFS provides the following services: Autism, IDD and Behavioral Services; K12 School Staffing Services and Training and Development Services. KenCrest provides the following services and supports:Autism Services; Educational Services; Residential Living; In Home Services; Vocational Services; and Professional Training. Founder and CEO Steve Potts, a Philadelphia attorney, created an online platform to help families have access to critical information. LifePath’s residential housing wasestablished for adults with developmental disabilities as the transition from institutionalization to community-based supports continued. New Avenue Foundation is registered with the IRS as a 501(c)3 Public Charity, a non-profit organization that promotes and supports employment, stimulating activities, skill-building classes and creative housing for people with disabilities. Learn about navigating the path to employment as a person with a disability, and find how to evaluate an employer’s standards of accessibility, accommodation and acceptance in order to find the right career fit. SYW is an Advocacy and Supports Coordination agency. An approved provider for the following Office of Long Term Living (OLTL) Home and Community Based Programs: Act 150 Program; Aging Waiver, Attendant Care Waiver; COMMCare Waiver; Independence Waiver; and OBRAWaiver. www.TheSpectrumCareers.com is a job portal for Employees, Job Coaches, and Employers offering employment opportunities nationwide to individuals who may not have the chance for a face-to-face interview. Rangam will automatically match you to a job specific to your skillset and location. Unending Promise provides support and information for individuals living with special needs, currently offer our Older Teens and Adults Social and Support Group. Mission is to provide adults living with autism, primarily in Berks County, Pennsylvania, opportunities to learnmeaningful skills in a safe and productive environment. C.F. 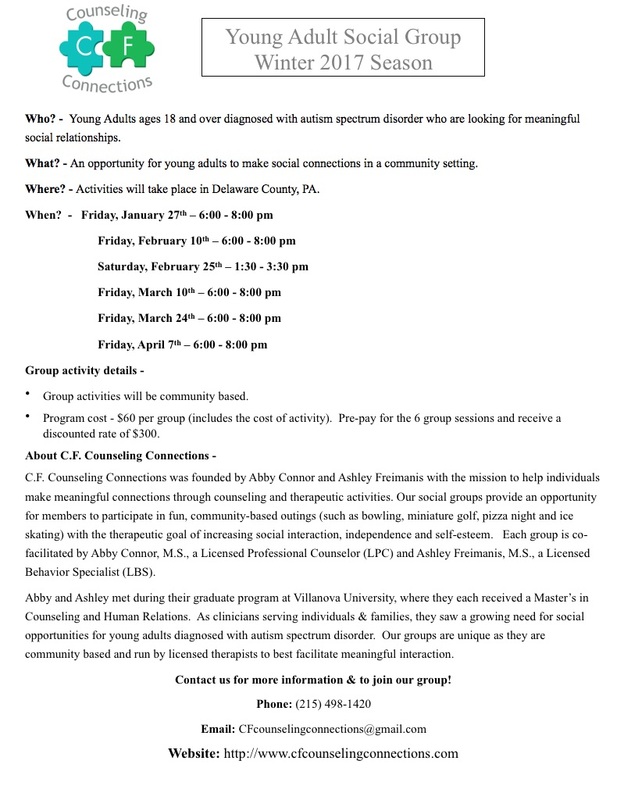 Counseling Connections' social groups provide community-based outings with the goal of increasing social interaction, independence and self-esteem. For adults diagnosed with autism spectrum disorder, 18-30 years of age.